Eco Fencing systems have strength, in independent testing Eco Fencing proved it has greater tensile strength than concrete posts. The posts are deigned to be flexible and so absorb and dissipate the energy from strong winds. Concrete posts will not flex and can break in high winds and severe storms. Once erected Eco Fencing DOES NOT require maintenance for protection against rot and decay. 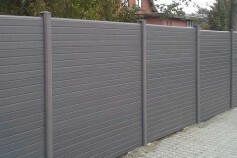 Eco fencing will weather naturally just like any other outdoor product and will become lighter in appearance over time, woodgrain will accept a timber stain should you wish to freshen up your fence in years to come. At less than 5 Kilos for a 6' gravel board Eco fencing is a pleasure to work with. Eco fencing is incredibly light, making general handling and transportation easy. All Eco Fencing products are dual faced giving you the perfect look to both sides, ideal for two neighbours to share the cost. Eco fencing systems are easy to install, whilst being incredibly strong, the advanced composite material is highly workable. The fence posts can even be cut to length with a simple hand saw.